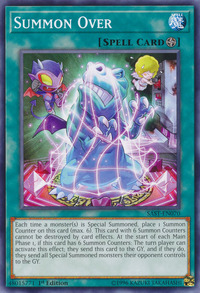 Each time a monster(s) is Special Summoned, place 1 Summon Counter on this card (max. 6). This card with 6 Summon Counters cannot be destroyed by card effects. At the start of each Main Phase 1, if this card has 6 Summon Counters: The turn player can activate this effect; they send this card to the GY, and if they do, they send all Special Summoned monsters their opponent controls to the GY. The summoned monster in Summon Limit and Summon Breaker appears in this card's artwork. This card depicts the event after Summon Breaker.